Production of Ford mustang began in Michigan in March 1964. The first generation Mustang was initially produced with a V8 engine that had 101 horsepower. The second generation Mustang was available in hatchback and coupe versions. However it was smaller in size and heavier and the performance was also reduced as compared to the first model. The third generation Mustang had a larger engine bay and trunk and it was large enough for four people. The available body styles included hatchback, coupe and a convertible. The fourth generation mustang came out in 1994. This was the first completely redesigned Mustang which was made with a 3.8 OVH V6 engine with a five-speed manual transmission or a four-speed automatic. 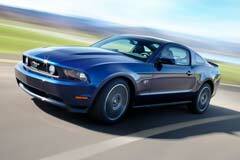 The Ford Mustang GT was introduced in 1999 which had the new 4.6L SOHC V8 engine. Besides the facelift for both the exterior and interior, the power trains are virtually the same. The fifth generation Mustang was introduced in 2005. Here Ford introduced a completely redesigned Mustang with a "retro-futurism" style. The base model is powered by a cast iron block 210 hp 4.0 l SOHC V6. The mustang GT is powered by an aluminum block 300hp 4.6 L SOHC 3-valve V8 engine. All 2008 Mustang seats are made from material derived from soy beans while the 2009 model has a new option of a full sun roof. 1966 Mustang Fastback 1966 Ford Mustang, Black with 14000 Miles available now! 1966 Mustang Convertible RED DROP TOP PONY, 289 CI V8, PWR STEERING, GREAT CRUISER, PWR TOP, NICE COLOR! !